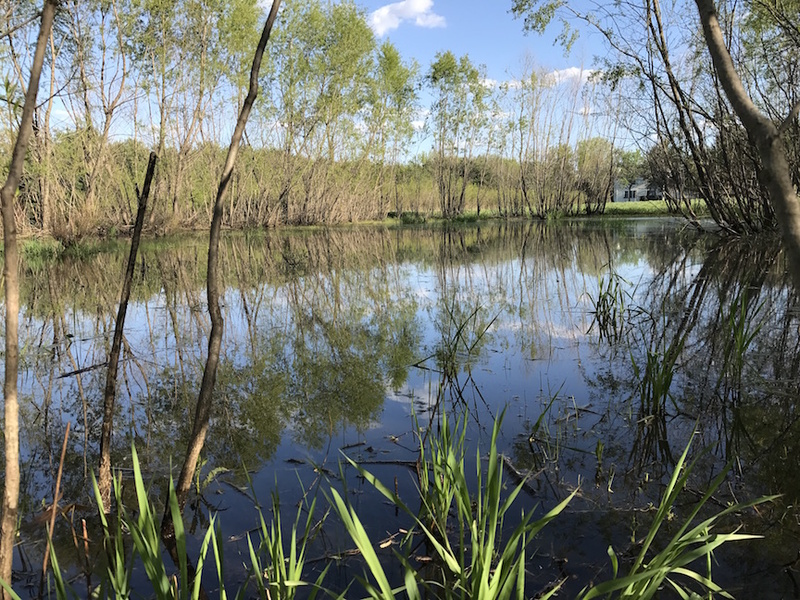 Kelly and Angie Tagtow are transforming their large acreage into high quality habitat for wildlife by reconstructing the ecosystems that naturally filter air and water, and store carbon. Pawpaws bloom in Angie and Kelly’s backyard. They love this native fruit’s custard-like texture and tropical flavor. He and Angie are avid gardeners and got to work planting some of the land with fruit trees, berries, and vegetables to eat and preserve. The remainder of the land was leased to a row crop farmer. 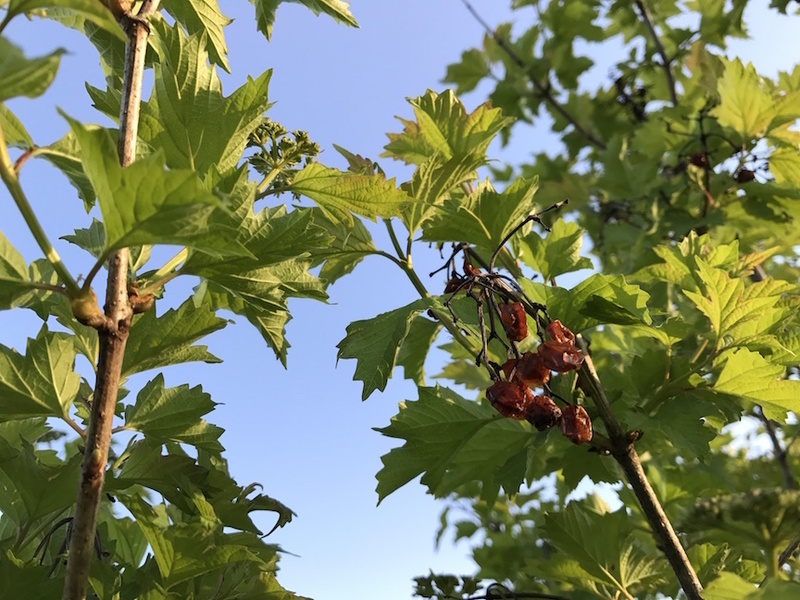 High bush cranberry bushes in the windbreak provide flowers for pollinators, and berries for birds and other wildlife. They began to think about ways to implement conservation practices on their own land. 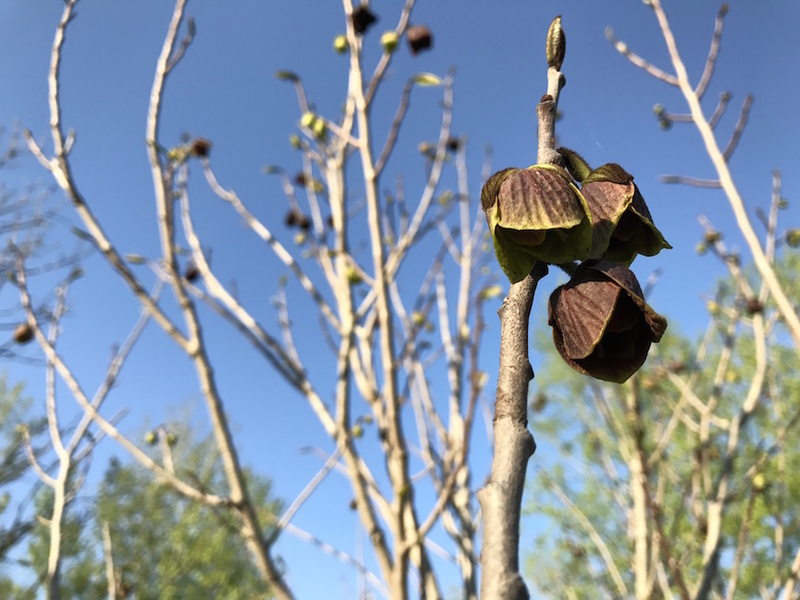 Kelly immediately began reshaping their landscape by planting hundreds of native trees and shrubs–oaks, hazelnuts, and dogwoods, and a windbreak with native plums, ninebark, elderberry, highbush cranberry, and eastern white pines. 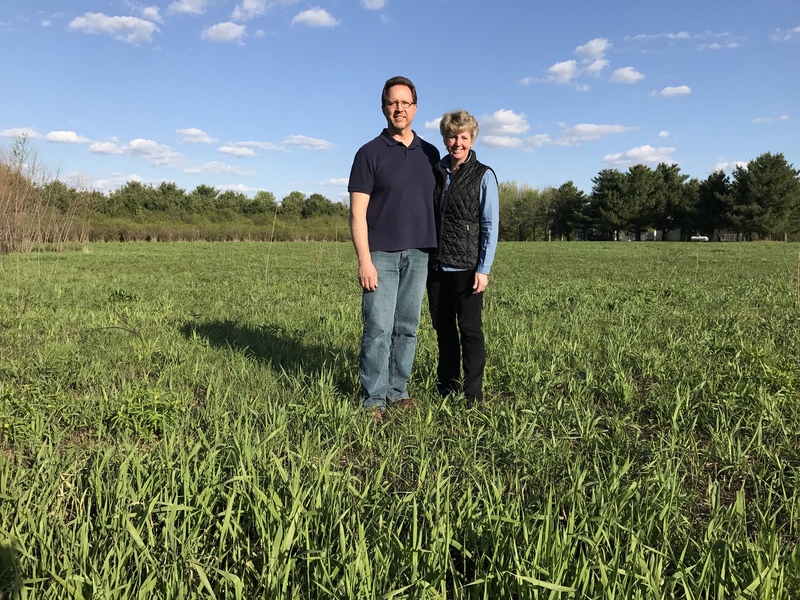 In 2002, Kelly and Angie seeded the eight acre crop field with diverse, local ecotype prairie seed and enrolled it in the Conservation Reserve Program (CRP). They also reconstructed a prairie pothole wetland in an area of the prairie where water naturally ponded. Just a few weeks after a springtime prescribed burn, flowers are already beginning to bloom in the prairie. A few years ago, Angie took a job in Washington, D.C. and Kelly began commutes to Decorah to work at Seed Savers Exchange. When they returned home to central Iowa a few years later, they took a fresh look at the landscape and discovered that the banks of the stream were eroding, and some about ready to collapse. In spite of the wetland slowing down the flow of water, an old, broken field tile was still actively headcutting in one part of the streambank. Kelly was not sure how to address this issue, but continued to think about and monitor it. The wetland is home to many amphibians and waterfowl, and provides a source of water for wildlife. 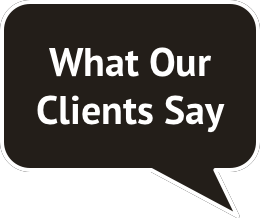 Then, this past winter, Angie and Kelly received a notice that the CRP prairie was due for mid-contract management. Kelly contacted Prudenterra to conduct a prescribed burn, but first, Kelly and Luke from Prudenterra walked around to take a look at the prairie and discuss other parts of the land that would benefit from management. 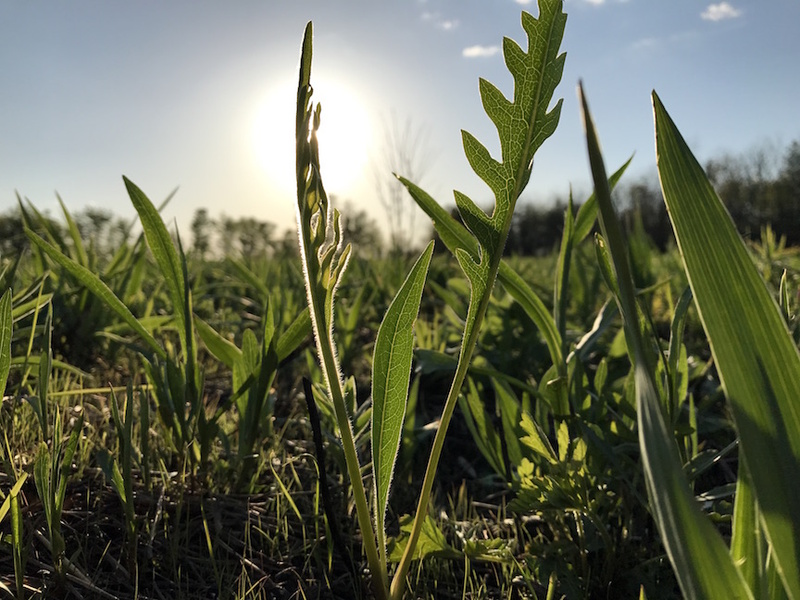 In addition to burning their prairie, Angie and Kelly decided to hire Prudenterra to thin their windbreak to improve the health of the remaining trees and enable them to grow laterally and provide better windbreak value. Finally, the Tagtows decided to have Prudenterra and Lee Searles of Leeward Solutions conduct a Stream Restoration Review to determine the cause of and solutions to the actively headcutting gully and other stream restoration options. Compass plant (Silphium laciniatum) is a native prairie species with yellow composite flowers that resemble sunflowers. It can live for as long as 100 years. 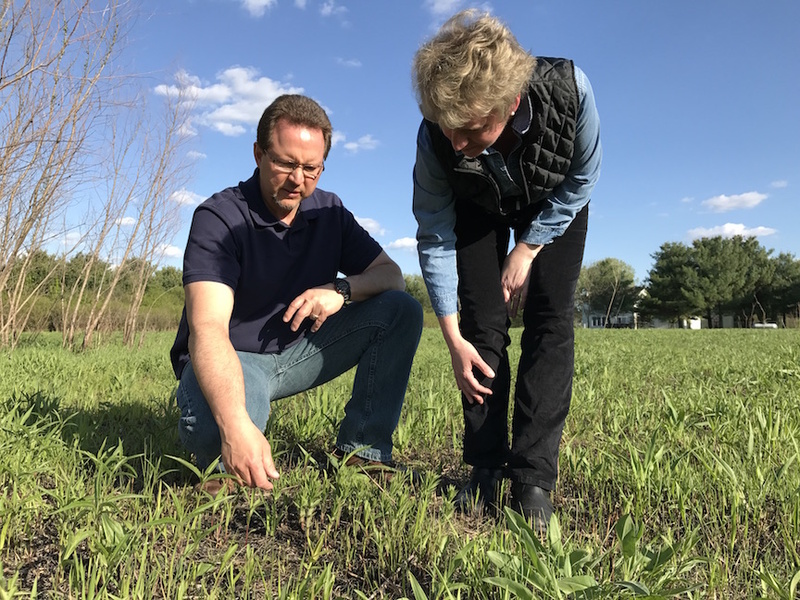 He and Angie hope that by restoring native ecosystems, “…we do our part to clean up the air and water a little bit.” After all, explains Kelly, Iowa used to be a state comprised entirely of prairie, wetlands, and woodlands. These ecosystems have a tremendous natural capacity to filter out toxins and store carbon. They are also generators of the rich soil which is the foundation of the agricultural industry, including the farm where he grew up and first gained an appreciation for the natural world.